Instead of the moon, choose mooncakes to represent your heart this Mid-Autumn Festival. With a mind-boggling array in the market, the sweet confectionery is selling like hot cakes (well, cold cakes if you prefer the snowskin version…LOL) from now until 8 September. True to tradition, Ee Cuisine offers more than 15 flavours to entice mooncake lovers this year. Besides baked and snowskin versions, the mooncakes come in regular and mini sizes. The latter feature distinct fillings of durian, corn with custard and blueberry to tease modern tastebuds. Health-conscious folks can even opt for the low-sugar white lotus paste with single yolk variant. Naturally the classics such as mixed nuts, lotus paste with single or double yolks, and pandan-infused lotus paste are perennial best-sellers. You can buy them individually from RM11+ each or in tastefully designed gift boxes of four (regular size mooncakes) and eight (mini mooncakes). Families looking to celebrate the Mid-Autumn Festival together can look forward to sampling Chef Yong Kam Wah's special dishes created just for the occasion. 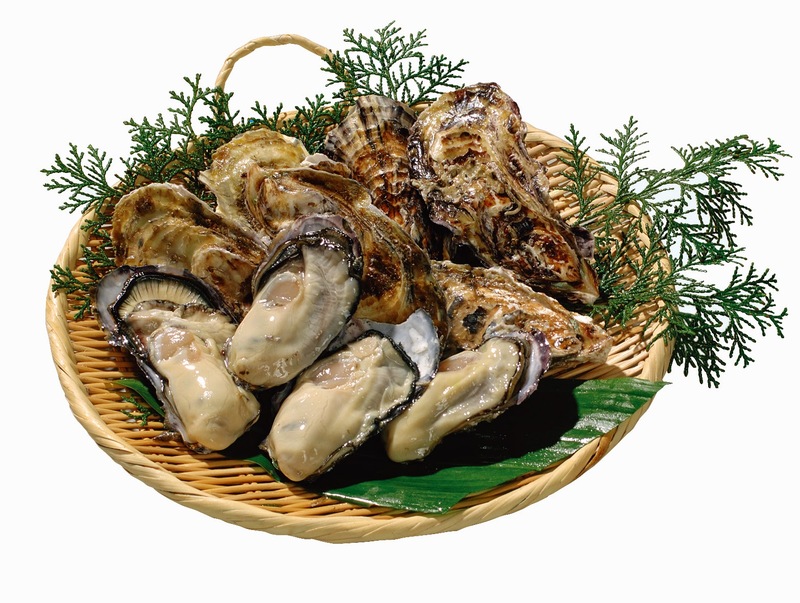 I can vouch for the scrumptious Gratinated Canadian Oyster with Lemon Cheese Sauce – an exquisite West meets East appetiser that marries the mollusk's inherent succulence with a mildly tangy yet creamy sauce that enhances its natural sweetness. The second morsel of Deep-fried Stuffed Prawn Dumpling is a surprise in itself; biting into the crisp exterior, the superior broth within is released in a delicious squirt that amplifies the crustacean's flavour. The Fish Broth with Mushroom, Lotus Root and Fish Mousse in mini claypot treads that fine line between East-West borders again. Slightly unctuous and creamy on the palate, the broth yields slippery smooth glass noodles, springy-soft fish paste quenelles, wolfberries and toasted garlic flakes. A daring, unusual combination that piques one's interest. Taking a retro turn, the chef proffers Baked Stuffed Chicken Wing with Savoury Sauce. Generously stuffed with squid paste, the plump chicken wing came sheathed in a sweet-tangy-umami-accented lacquer-like sauce that will leave you licking your fingers and plate clean. Crunchy pickled papaya slices and a sole lychee complemented the dish, to add subtle bursts of flavour and to temper any overly cloying aftertaste. Delicate nuances prevail in the Charcoal Beancurd with Crispy Enoki; a clever intergration of soft and crunchy textures with simpler, low-key tastes that totter close to blandness. Again it's a dish that should have everyone Instagramming it at once. Okayama is a prefecture in the Chugoku region on Honshu Island. Rich in history and culture, Okayama is known as The Sunny Land of Japan. Popular tourist sites range from temples and art museums to gardens and onsen (hot springs). 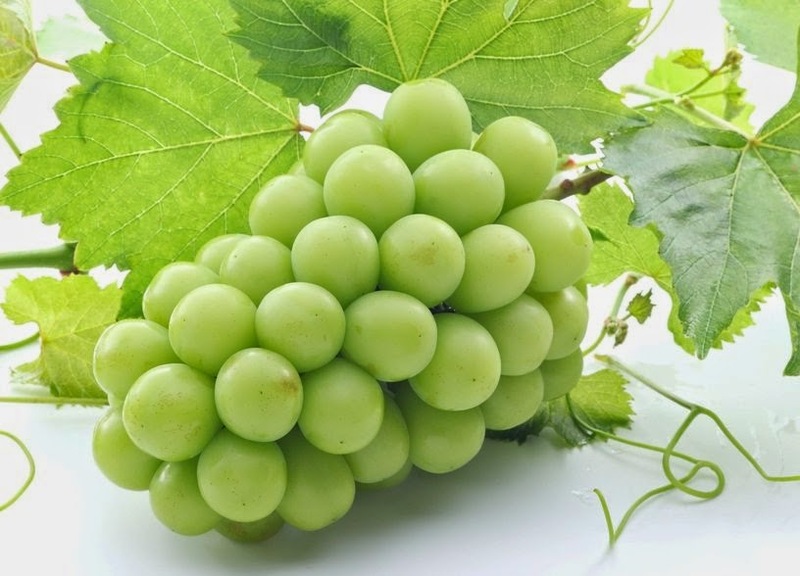 The prefecture's mild climate also makes it ideal for the cultivation of rice, fruits and vegetables, as well as seasonal fishes and marine products. From 22 August to 5 September, the Okayama Summer Food Fest at Kampachi will showcase Okayama's bountiful offerings where patrons can savour special a la carte (RM25++ to RM65++) items and kaiseki set menu (RM250++ per person) featuring the prefecture's abundant produce. A recent sneak preview gave us a taste of Okayama's choice produce starting with Kampachi's multi-course menu – Nama Gaki Ponzu as the star of the show. The pair of huge, fresh raw oyster are the biggest I had ever savoured! Their smooth, succulent flesh are thicker with a richer body than that of Kansai's which made it a sensuous delight to eat. The shellfish's oceanic sweet-briny nuance was enhanced by a dash of tart yet faintly fruity Japanese citrus vinaigrette to balance its voluptuous richness. Coming in at a close second at stealing the show is Togan no Ebi Soboro Ankake (RM32++), Okayama wax gourd and minced prawn with a thick sauce known as ankake. According to Chef Koji Tamaru, the clear, viscous broth – a concoction of dashi, mirin, shoyu and starch – amplifies the dish's delicate accents while fine slivers of kinusaya (boiled snow pea) add crunch and minced prawns, hints of sweetness. Even vegetables were accorded reverential respect as shown in the Okayama Yasai Salad Goma Dressing (RM35++). The Okayama vegetable salad came presented in a thick and surprisingly sweet tomato 'cup' holding tender green asparagus, kinira (yellow leek), itouri (spaghetti squash) and endaibu (endive) served with sesame dressing. Pay close attention and you'd detect a subtle oniony sharpness to the crunchy yet firm yellow leek and the pasta-like 'al dente' texture of the spaghetti squash. Do you know that the fully ripe winter melon actually breaks apart into long, thin spaghetti-like strips when boiled? These splendid vegetables were accompanied by some tender shimeiji mushrooms drizzled with toasty sesame dressing. The trinity of Okayama tomato, asparagus and yellow leek made another appearance in the Salmon Carpaccio Roll. Served with wasabi dressing, the raw slices of salmon are rolled with asparagus and leek in a shoyu-wasabi dressing that I thought was a tad too overwhelming. A scattering of avocado dices, globules of salmon roe and crisp fried garlic flakes gave the dish extra colour and textural interest. 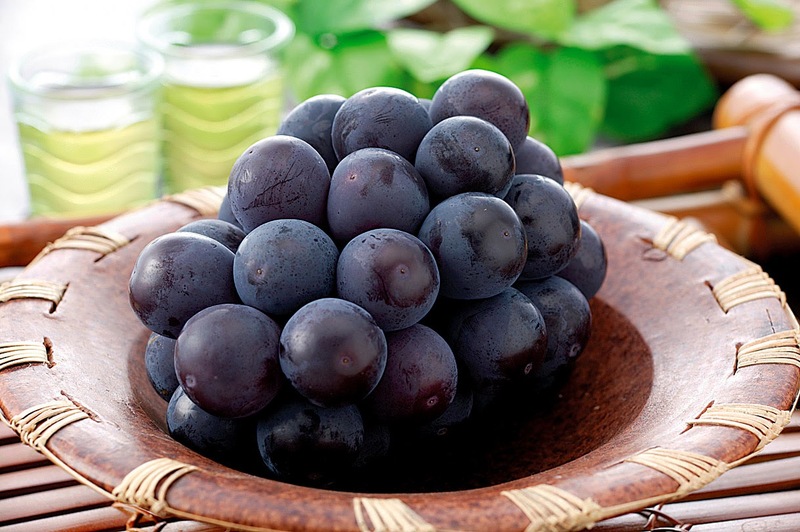 Our just dessert came in the form of Pione (RM38++), imported Okayama seedless Pione grapes that were large (almost the size or even bigger than quail's egg) and bursting with juicy sweetness that has the barest splash of boozy finish to it. 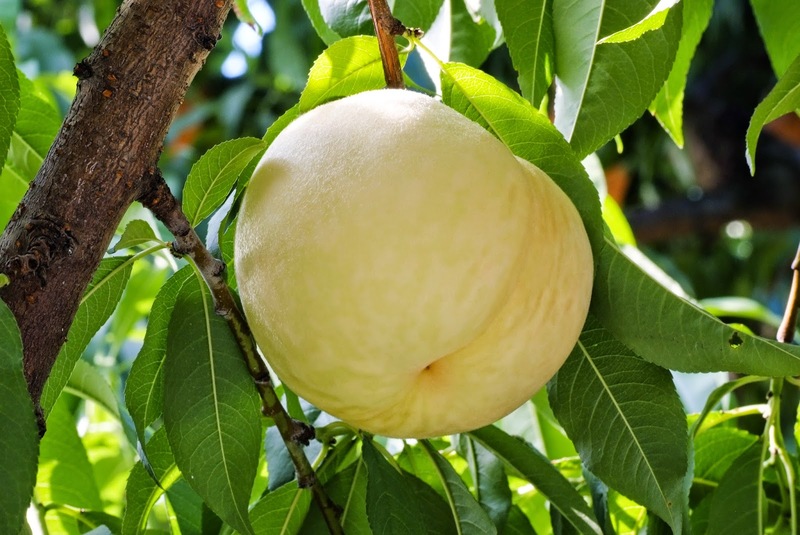 Other air-flown produce available during the promotion period will be Okayama Melon, hakuto (Okayama White Peach) and mushrooms (shimeiji and shiitake). 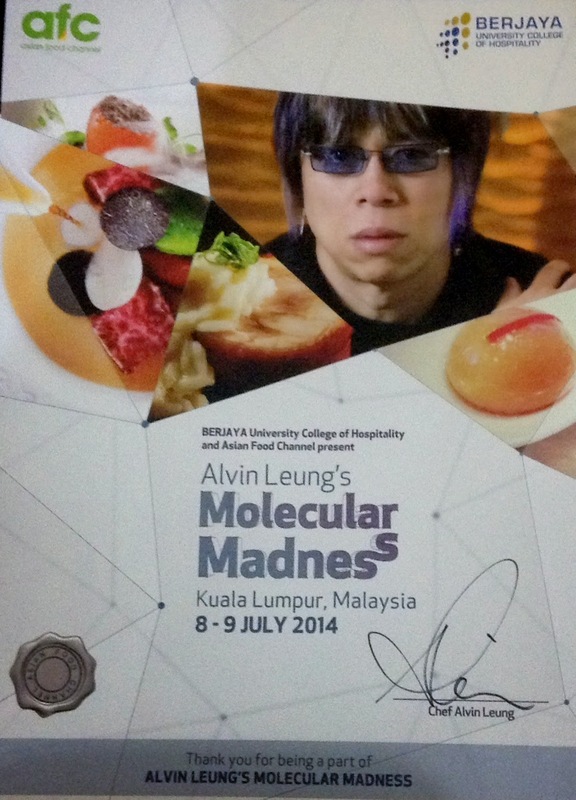 Three Michelin-starred chef Alvin Leung dazzled us with his X-treme Chinese cuisine to KL recently. The Demon Chef turned local and regional fare like bak kut teh, won ton mee, chilli crabs and oyster omelette on the head, combining innovative cooking techniques with traditional Chinese and non-Chinese ingredients to push culinary boundaries. You either like or dislike his brand of cuisine, there's just no two ways about it. As with any experimental dishes, hits and misses are natural but for the hospitality students from BERJAYA UCH, it was a rare opportunity to learn how Malaysian inspired dishes can be given unique gastronomical twists from a world renowned master chef. Together with Asian Food Channel (AFC), the region’s leading food-focused channel that celebrates unique Asian culinary experiences with the added touch of global flavor, Leung and the BERJAYA UCH team rustled up a sumptuous 5-course menu at Samplings on the Fourteenth for lucky us who were invited to attend. A chorus of 'oohs' and 'aahs' heralded the second appetiser of UMAMI WON TON MEE as everyone gushed over the delicate sheet of crispy ebony-black squid ink paper adorning the duck breast “char siu”, langoustine tartar, rice noodle & vermicelli flavoured with “har mai” essence. We love how the dried shrimp oil lent a savoury richness to the noodles (similar to “har jee meen” or prawn roe noodles) with the langoustine's inherent sweetness balancing the flavour profile. Surprisingly the chef's inventive “char siu” duck tasted more like “lou” (braised) spongy-chewy brown sotong; the only oddity in an otherwise delectable dish. The star dish of the night was Leung's CHILLI CRAB / OYSTER OMELETTE GAZPACHO. Our gustatory juices were stimulated the minute the aromatic hot gazpacho was poured onto the mound of fresh crabmeat topped with a quail's egg in our plates. Served with a dainty portion of oyster custard on the side, the cohesion of flavours and textures uncannily mimicked that of chilli crabs! Compressed watermelon cubes brimming with the woody “dong gwai” or Chinese angelica nuance left us reeling with delight when we savoured the BAK KUT TEH SHORT RIB. The meaty cubes of tender beef ribs and mini Yorkshire puddings hit all the right notes with dollops of bak kut teh chocolate – similar to that of a full-bodied mole. Those who opted for the CHICKEN RICE found themselves digging into nutty, risotto-type rice known as Aqucallo that has been aged nine years. Cooked with chicken stock, pandan and ginger, Chef Leung said it was inspired by Hainanese chicken rice albeit with Hong Kong influences thrown in. Cat ear fungus was added for textural interest while the sand ginger cream mimicked the minced ginger condiment that's ubiquitous in chicken rice. The chicken component came rolled up with crisp, thin skin on the outside. We were the first to taste his MODERN AIS KACANG – a riotous platter of different ingredients in dazzling hues: peanut butter & condensed milk ice cream, freeze-dried raspberries, cherry snow, banana caviar, pandan chocolate chips, red bean meringue, salty caramel popcorn, sous-vide strawberry with Sichuan and maple syrup, and a Blue Hawaii sphere. 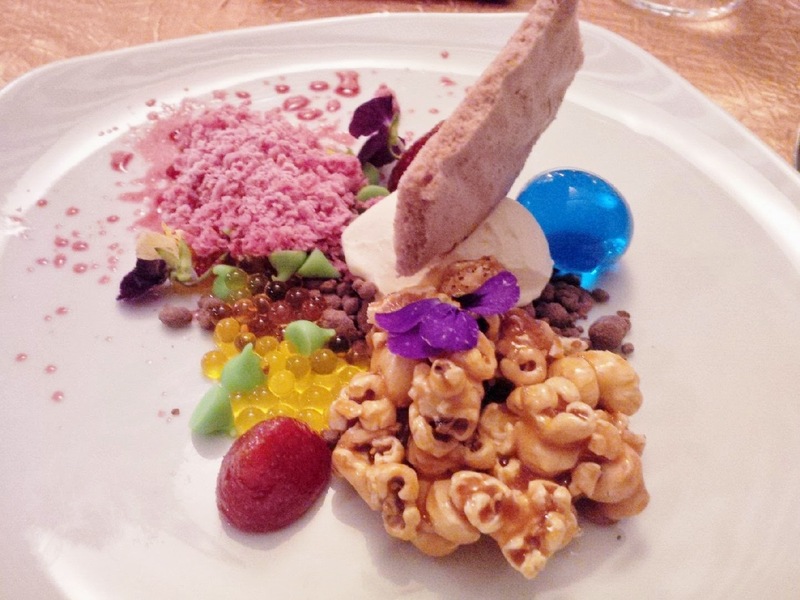 Personally, I think the mish-mash didn't gel all that well especially the tart and slightly bitter blue cocktail sphere and chewy popcorn. Born in London, raised in Toronto, Alvin Leung is known as the “Demon Chef” for his quirky ability to combine culinary art and science; rocking diners with new taste sensations at his three Michelin-starred Bo Innovation in Hong Kong and one Michelin-starred Bo London. Besides Heston Blumenthal, he is one of two self-taught chefs in charge of a professional kitchen that has ever received Michelin stars. Leung is also one of the judges in MasterChef Canada. Despite his larger-than-life, rock & roll persona, Alvin Leung is really a sweetie and humble chef. He even remember to thank the students who rallied around for the special dinner which says a lot about him. Of course, we were over the moon when he readily posed with us for photos and greeted his fans, going from table to table. For that, he gets two thumbs up. For more information about Asian Food Channel and its programmes, please visit www.asianfoodchannel.com. 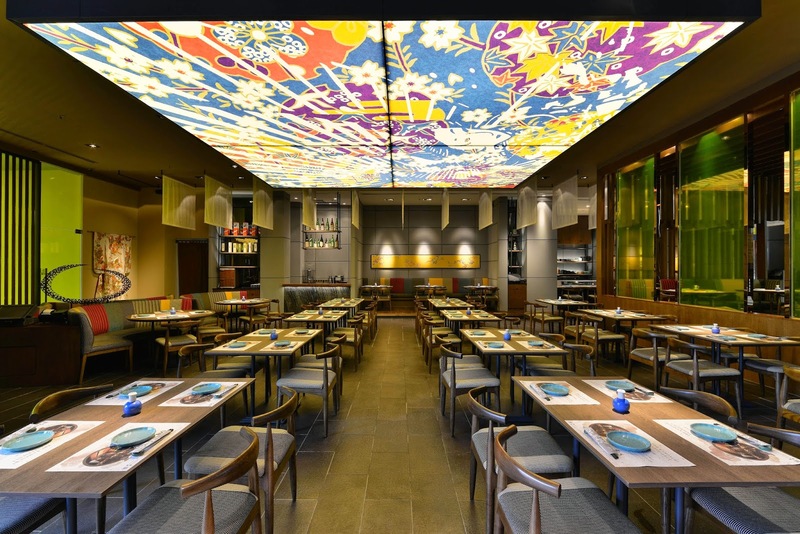 Crab craze has hit KL and foodies are scurrying to ParkRoyal KL's Chatz Brasserie to have their fill of crabs, crabs and more crabs at the Seafood Buffet dinner every Friday and Saturday this month. With 10 - yes, 10! - types of crab dishes available, you can gorge yourself silly for only RM85 nett per person. Now isn't that a tasty deal that's simply too irresistible for words? The gigantic fresh meat crabs were no match for the hungry hordes who dug in with gusto that Saturday night we went. Right on the get-go, every crab part in sight was grabbed, cracked and crunched thoroughly to extract that sweet, firm meat. Oh, the spread also includes a King Neptune's treasure trove of fish, prawns, clams and oysters prepared in every imaginable way but nothing could steal the spotlight away from the meat and flower crab dishes. Honestly, the Steamed Crabs with Egg White which best captures the crustaceans delicate, inherent sweetness during our sneak preview didn't fare as well on the buffet but the freshness was at least clear and discernible. I missed the jus that pooled at the bottom of our crab dish that; coupled with the smooth custardy egg white it was out of this world. The rich, creamy Butter Meat Crabs also floated our boat on the preview night. Bursting with strong, piquant aroma of curry leaves and mild spice flavour, the freshly extracted crab meat was da bomb when eaten together with pieces of fluffy soft mantou soaked in the unctuous sauce. When cooked in large portions, the sauce was a spread a little too thin although you can still taste the creamy richness. Coming in at third place is the Fried Crab with Marmite Sauce -- a full-bodied, umami-rich creation with dark, slick and savoury lacquer-like sauce which emphasises the natural sweetness of those meaty crabs. Kicking things up a notch or two are Fried Chilli Meat Crabs and Kam Heong Crabs. Both robust preparations are likely to set your tastebuds a-tingling and derive great enjoyment from that chunks of sweet crabmeat. Personally, I find the Fried Meat Crab with Salted Egg a tad gritty for my liking but for those big on seafood crusted with salted egg yolk crumbs, this will certainly hit the spot. More well-rounded with a nice balance of tangy-sweet-brininess is the Sweet and Sour Meat Crabs. Wreathed with eggy wisps, more mantou won't go remiss for this particular dish. Nods to local influences come in the form of Blue Flower Crab Masak Lemak Nenas and Fried Blue Flower Crab with Chilli & Spices. For me, the big, bold and lusty meat crabs already stole the thunder so I'd leave you to draw your own conclusions on the two dishes. Also the Deep-fried Soft Shell Crabs seem like a non-event unless you're too lazy to tackle all that shelling. Every table is presented to a whole steamed fish...much as we appreciated the extra fringe benefit, it was such a pity that the dish was "lost at sea". Diners were just too distracted to care much for the fish. Of course, the extensive buffet will also tempt you with everything from hot and cold appetisers to soup and salads as well as delectable mains such as Fried Yee Mee with Crabmeat, Baked Crab Pudding, Tom Yam Crab Noodles and Baked Salmon with Crabmeat Cream Sauce at the cravery station among others. And we haven't dive into the plethora of dessert and freshly squeezed juices yet. Call Chatz Brasserie, tel: 03-2147 0088 for reservations now as places are filling up fast!